If you would be so fine as to indulge this writer in a short anecdote, I believe I can illustrate what you can expect from the most recent Fable 2 DLC, titled simply "See The Future". Mummies, Omar Shariff and the Cinesphere all to appear in this grand explanation after you click that all-important "Read More" button! It was back in my joyous youth that I happened to catch a movie about ancient Egypt at the Ontario Place Cinesphere on a warm summer day. The movie was about mummies and more specifically, the mysterious curse said to be placed upon anyone who disturbed their eternal rest. Along the way, a knowledge-hungry young girl demanded her grandfather tell her all about the mysterious curse that threatened all those foolish enough to ignore it. Her wise grandfather (Mr. Sharif) chuckled and promised to tell her all about it, right after he explained some basic historical facts about archeology and the history of Egypt. Much like that child onscreen, I sat through an hour of somewhat interesting facts about Egypt, but also like the child, I kept wanting to know about that curse! So when all of the facts had been revealed and the time had finally come, Omar Sharif patted his expectant grand-daughter on the head and said "the truth is my dear, the Egyptians loved life and never would have placed a curse on anyone!" Now, if you are wondering how this ties into Fable 2, I submit to you this reasoning; simply exchange "Seeing the Future" with "Mummy Curse" in my previous paragraphs and you will have an idea exactly how satisfied you will likely feel at the end of this DLC. See The Future is a straightforward carrot and stick routine. The problem in condemning this (or perhaps Fable 2 as a whole) is that it's a beautiful carrot. Your character will visit some visually striking locales during the course of this DLC, and the witty dialogue and colourful characters are as present as ever. The problem is that this DLC was not titled "Laughs and Colours", it is "See The Future", and simply put, there's next to none of that. 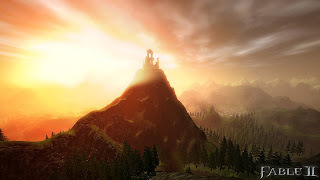 When your time comes to see (and I stress the word see rather than "interact") with the future, you will ultimately be left without any sense of satisfaction, but more of the same ambiguity that characterized the end of Fable 2. What you will get are 2 new quests to undertake, which in all fairness are enjoyable. Additionally there are new dyes, hairstyles and armor to collect, along with the ability to change your faithful mutt into various new breeds. If you simply must have more Fable 2, this DLC will give you about 1.5 hours worth of additional content, provided your main interest is the main quest. The addition of a Crucible-style Colosseum mode will add some replay time onto that. I would caution anyone seeking an advancement of their character's greater story though, because as far as that goes it's looking more like you'll have to wait for Fable 3 to catch more than a glimpse of what is yet to come for Albion. See The Future is available on Xbox Live for 560 MS points.